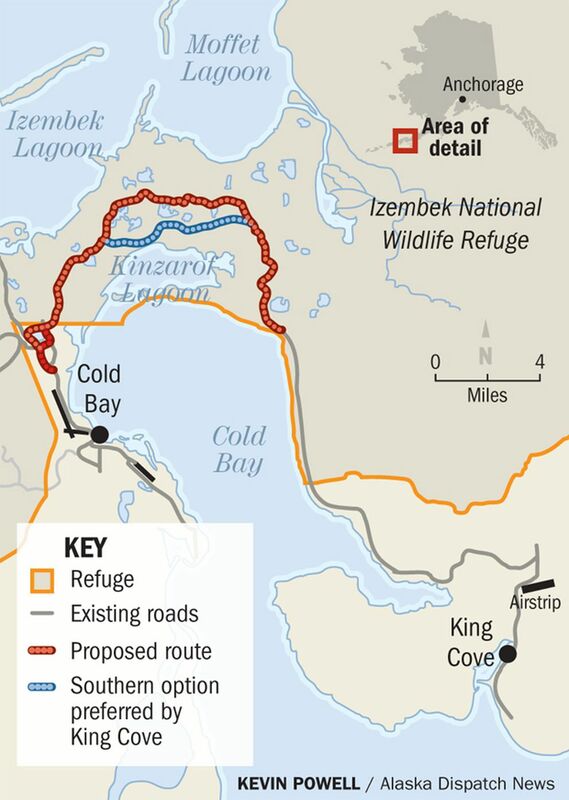 WASHINGTON — The U.S. House passed legislation Thursday that would give the remote Southwest Alaska town of King Cove the ability to build a road through the Izembek National Wildlife Refuge. The bill's passage is a major step forward for a decadeslong effort by the town of about 900 people to find an easier way to get to the neighboring community of Cold Bay, with its jet runway, for medical emergencies. "We're talking about an 11-mile, single-lane, gravel road to provide access" to hospitals that are "600 miles away in Anchorage," Rep. Don Young, R-Alaska, said on the House floor Thursday. He spoke of elders evacuated in crab boats and a woman who died in a Coast Guard helicopter crash while being airlifted for medical care. "Let's do what's right today in the House of Representatives," he urged colleagues, saying the people of King Cove deserve "to experience the medical care that the rest of us have." Flying in and out of the town is often perilous, with a short runway squeezed between two mountains and flights canceled about 100 days out of every year. But one of the state's longest runways — a World War II holdover — sits in Cold Bay. The latest legislation is far from Young's first effort. President Bill Clinton vetoed a bill allowing a road during his term. He and the late Sen. Ted Stevens secured funding for a hovercraft during President George W. Bush's administration, though Young said Thursday that they never expected that to work in the long term. "We weren't (getting) anywhere, and we were trying to save lives, … which we worked very hard to do, but it didn't work." During the Obama administration, the Alaska delegation managed to pass legislation that handed the choice to the Interior Secretary — a ferry, a road, an airport or nothing. "And of course, (Interior Secretary) Sally Jewell chose nothing," Young said. The Obama administration said that a road through the land connecting King Cove and Cold Bay would have unacceptable impacts on birds and other wildlife, and would damage a federally protected wilderness area. Now that Republicans control the House, Senate and White House, Alaska's congressional delegation hopes to bypass administrative difficulties with legislation that would allow construction of the road and a land exchange between the state and the federal governments. A bill offered by Young — HR 218 — passed the U.S. House 248-179 Thursday. A few hours after the bill passed the House floor, Young was in good spirits in his Washington office. "Overall, I'm pleased. We got 15 Democrats, lost three Republicans," he said. The legislation would authorize an equal-value land exchange between Alaska and the federal government, handing the state a 206-acre corridor within the 315,000-acre Izembek National Wildlife Refuge where the 11-mile road would be built. The other options aren't viable, Young said. "OK, you want to put $150 million into building a heliport and the permit to knock a mountain down, yeah, we can build one. But they're not willing to do that, so this is the easiest way to do it. There's no federal money involved; 11 miles at the end of a road already finished. And it doesn't bother the geese," he said. Young dismissed questions about the potential that the road would be used for other reasons, such as local hunters, or that it could create a precedent for other refuge areas. "I mean, they're hunting already," he said of local residents and outsiders. "They're shooting the same geese in Bethel now," he said, and noted that locals already accessed the land with all-terrain vehicles. As for a precedent elsewhere, it "can only be followed through if someone else has the same perseverance that I've had," he said. And roads should be allowed on refuges, he said. Refuges were "set up for fish and wildlife, hunters and recreation. Not for isolation," he said. "A park, maybe. But not a refuge. It's a multiple-use concept for recreation purpose — hunting, photography, hiking, driving, the whole bit." The bill now must pass the Senate, an effort likely to be led by Alaska Sen. Lisa Murkowski, who has introduced similar legislation. The bill faces a more difficult road there, where the floor schedule is filled with health care negotiations, Trump administration appointment confirmations and upcoming debt-limit and spending fights. Young was optimistic about the road's chances, saying that whether the Senate passes legislation or not, he expects construction to begin by the end of the year. The legislative option offers an easier work-around to the process already underway to undo the staunch "no" that the town got from the Obama administration. "So we hope to pass it through the Senate — the two senators are working very hard, but I've still got one more ace in the hole," he said, speaking of opportunities to get a road built using administrative powers of the Interior Department. 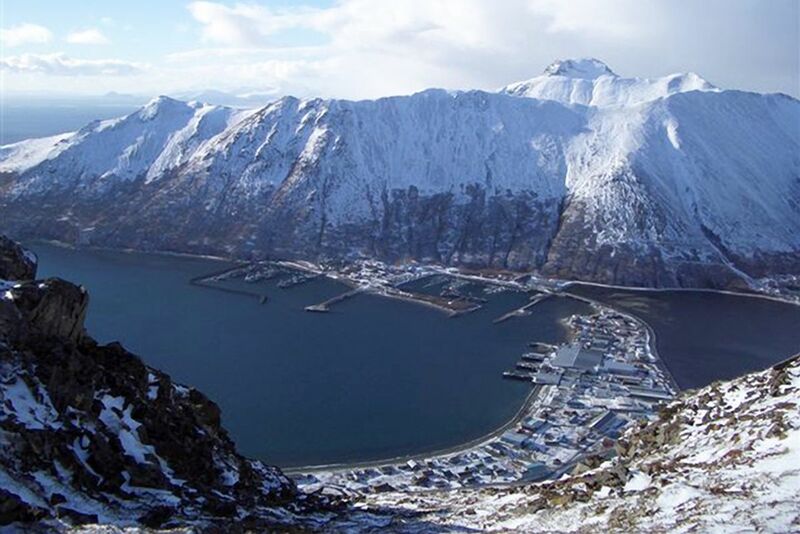 Last month, the Interior Department granted the state permission to begin looking for the "least impactful route between King Cove and Cold Bay," according to Alaska Gov. Bill Walker. That step was a move toward new environmental justification for an 11-mile gravel road through the refuge. Walker lauded Young's accomplishment and said that the state, federal agencies and the congressional delegation would keep working toward their shared goal of building the road. King Cove Mayor Henry Mack said the legislation and a new willingness out of the Trump administration is offering a "light at the end of the tunnel." "We and our loved ones are hopeful we will soon have the peace of mind knowing we won't have to fly or travel by boat in dangerous weather during a medical emergency. That means the world to us," Mack said. Murkowski and Sen. Dan Sullivan, R-Alaska, commended Young for the bill's passage. "After years of needless suffering, including 63 medevacs since December 2013 alone, I am grateful to have bipartisan support in Congress and — finally — an administration that understands why a road is the best and only option to truly protect the health and safety of local residents" Murkowski said in a statement. Murkowski has tracked the number of medical evacuations — sometimes carried out by the Coast Guard — in the years since then-Interior Secretary Sally Jewell rejected a land-swap agreement that would have allowed road construction. Sullivan said the federal government had aimed to protect birds over people. "This is unconscionable. I thank Congressman Don Young for his fierce determination to get this bill passed in the House, and will work with Senator Lisa Murkowski to pass it in the Senate," Sullivan said.